Which barbecues should you buy without getting your fingers burnt? Food cooked outside does taste better. It’s that time of year again. The sun is shining, there is a cool breeze keeping you good company, and inside the freezer, a six-pack of beer is getting cool. It’s time to fire up the barbecue. An hour later, you’re all munching on burnt sausages while mumbling how sausages cooked en plein air always taste better. The truth is, they don’t: on the outside, the sausages taste like charcoal and on the inside, they are so raw that you half expect them to squeal. Then a sudden flare up reminds you that you forgot the potatoes on the grill. You rush to control the fire while your wife scrambles to the telephone like a top Rugby Union player. Five minutes later, you hear the panicked sound of a fire engine getting closer. On paper, barbecues don’t make any sense. Why should you cook in the garden using rudimentary equipment and fuel your cave dwelling ancestors were familiar with, when less than 10 feet away you have a fully equipped kitchen? Nonetheless, barbecues are fun. The air heaves with the smell of sizzling fat and there’s a musical score of crackling foil and the metallic tinkle of really hot charcoal getting hotter. Food cooked outside does taste better, even when it’s a bit charred. And what joys stoking a fire, even if you burn a couple of fingers in the process. Of course, it all depends on choosing the right barbecue. Your first consideration is to choose how you want to cook your food: over gas or charcoal. First of all, the choice depends on cost: gas barbecues tend to be more expensive to buy and run than charcoal ones. But it’s not just price. Gas barbecues are more efficient, have a clean burn and heat up almost immediately, which means that you can start grilling after just a few minutes of preheating. Moreover, you can regulate the temperature and have multiple burners so you can cook food at different temperatures. Gas barbecues also have better heat distribution. If you have a substantial budget, you can splash out on extra elements such as additional burners, infrared heat sources and rotisserie. Charcoal barbecues have their advantages too. The taste of food cooked on charcoal is distinctive: because meat, for instance, cooks slower on charcoal, the moisture stays in, making the meat juicier. You also get that distinctive smoky flavour. However, cooking over charcoal requires a bit of preparation and you will need to wait for about 15 minutes before you can start cooking. Charcoal barbecues are also renowned for flare ups. These happen when accumulated grease drips on hot charcoal. When buying your barbecue, make sure that the grill is designed in a way that the fat is vaporised immediately or is channelled away from the charcoal. You also need to choose the material a barbecue is made of. The heavier barbecues are made of better steel. Porcelain or enamel coatings also offer better resistance to bumps, scratches and heat and are easier to clean. Barbecue designs vary and choice matters on your taste. You can, for instance, invest in a barbecue that comes with a hood. This is not just a design element – the hood will help you control the heat better and cook food throughout. 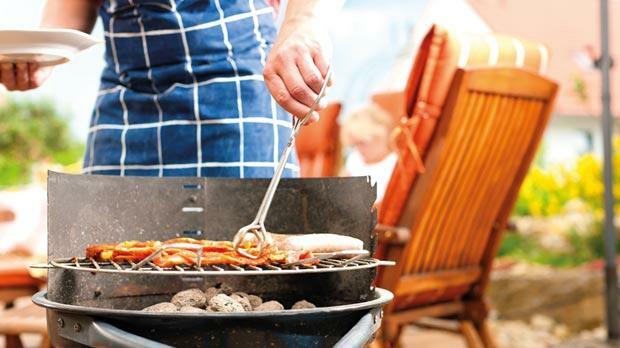 Other elements, such as different height grills, utensil storage areas and a plate warming function all add to the fun of the barbecue experience. As for the size of the barbecue, this depends on the space you have available and the amount of entertaining that you do. If you usually organise a family barbecue, then a small or medium sized grill should do the trick. However, if your barbecue nights are a big affair, then go for a large grill on which you can cook plenty of food. After all, the essence of a barbecue is that the more guests and food, the better.